Acoustic panels are an effective way to reduce noise and control sound in a wide variety of different space and improve audibility in areas that suffer from reverberation issues. If the ambient acoustics of your project suffers from reverberation, sound distortion or echo, Ace Acoustics (UK), with the superb, competitively-pricedWhisper Walls® systems, will have the answer with bespoke acoustic panels in absorber class 'A', 'B' or 'C'. We offer a huge range of panels in a variety of sizes and finishes to meet your specific needs. Panel options include our site-fabricated, acoustic panel system and our factory built demountable panels, which include Tack-able 23mm,Tuning 43mm & Wall Hung 54mm. The standard site-fabricated acoustic panel system allows the designer virtually unlimited freedom to create any design from the very traditional to the most intricate. The result is limited only by the designer's imagination. 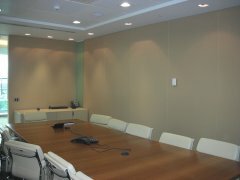 The overall result is a beautiful wall surface with the added benefit of pleasing acoustics. Of course, the system has the ability to use any type of material behind the fabric, whether it is acoustically absorptive, reflective, tack-able or even a combination of all three. When a sound ceases in a space, the sound continues and reflects off hard walls, floors, and ceiling surfaces, and this reflecting sound is known as reverberation. This creates an unwanted echo effect, which impairs audio sound and speech intelligibility. Reverberation time (RT) is the period in which the sound originally began to when it decays, measured in seconds. Introducing Whisper Walls acoustic panel systems in spaces will reduce reverberation time, to adequate levels for individual spaces. The amount of reverberation that will occur in a space depends upon the volume of the space and the acoustically absorptive quality of the room. 2 perfect for controlling reverberation time and, as such, reducing echo in a wide variety of commercial and public building environments. Acoustic panels are an effective way to reduce noise and control sound in a wide variety of different spaces. The standard system is composed of three components; a patented polymer stretching system, a core infill and a fabric of your choosing. The design professional need only select the system depth, edge profile, core requirements and fabric, in order to create a system to satisfy both acoustic and aesthetic. We are committed to delivering the highest possible standard of design and quality when it comes to acoustic panels. Site fabricated acoustic panel systems are available in standard 12mm, 23mm, 27mm, 32mm & 52mm depths. Other speciality system depths are available to meet with architectural specifications and drawings. Edge conditions come in four standard configurations: square, bevel, radius and welted. Speciality mid-wall conditions can also be achieved in the form of integrated reveals. Available in several widths and incorporating the standard edge conditions, reveals offer the designer a dramatic styling tool. Reveal cavities are available as recessed, flushed, or raised conditions and have been engineered to compliment LED strip light systems. Reveal finishes can also include paint, wood and metal. At Ace Acoustics, we are experts in the installation of acoustic panels in an extensive range of spaces. Our highly skilled and experienced team ensure that your panels are installed quickly, efficiently, and to the highest possible standard – allowing you to achieve the best possible results. The acoustic panel system can be installed in two stages. The stretching system and core can be installed as part of 'wet works' - while painting and plastering are still being undertaken and before the building is weather tight. Unlike many decorative finishes, the fabric can be installed as one of the last jobs of the project, just before or after the floor finish. Professional installation is a very quick & clean operation that can be performed outside business hours, during school holidays and anywhere worldwide. Once your acoustic panels have been installed, it's important to keep them looking their best and performing to the highest possible standard. This can be achieved through the appropriate cleaning and regular maintenance. Ace Acoustics has a cleaning and maintenance service, which involves re-tucking of any fabric that may have accidentally come loose by the owners. We also provide a light clean to remove any dirt marks or dust, to make your panel system fresh again, and all for a small cost. Should there be severe damage to fabric panels or removing acoustic panel components for assistance to other maintenance services for their works to be carried out, please contact us, as we will be pleased to assist you. Or, if you require any further information about our acoustic panel cleaning and maintenance services, or to discuss your requirements further, please contact us. Acoustic panels can be used to reduce noise and control sound in a wide range of applications, including financial institutions, offices, telepresence rooms, video conference rooms, office pods and meeting rooms, sound studios, restaurants, food courts, community centres, sports halls, home cinemas, theatres, places of worship, multi-purpose spaces, prisons, hospitals, reception areas, marine vessels, TV and radio broadcast studios, auditoriums, airports, classrooms, libraries, coaches and quiet-booths. Available in a huge variety of sizes, types, and colours to accommodate your design, budget, and durability requirements, it's possible to create an acoustic panel system that truly meets your needs and expectations. Our skilled and experienced team are fully equipped to help you to identify the best possible acoustic panel systems for your space and application.